Excuse me… But, wasn’t that our goal all along? …Wasn’t ousting the brutal dictator, bringing freedom and democracy, and securing the nation until the country can successfully take over operations the goal for Iraq? I realize the Bush Administration has not done a fantastic job getting the message out, but isn’t this what we set out to accomplish? We didn’t promise Iraq a rose garden, just freedom from a brutal tyrant and democracy! The Iraqi forces already control a majority of the country. Oh… And, it has nothing to do with talking with the mullacracy next door! Iraqi Security Forces are on track to take care of their own security and combat operations virtually free of Coalition support within the next year, Multi-National Force – Iraq’s spokesman told reporters Tuesday. This transfer represents the 70 percent mark of Iraqi army divisions’ headquarters assuming responsibility for the battlespace. There are 10 Iraqi army division headquarters, and this will be the seventh fully trained division, joining the 1st, the 4th, the 5th, the 6th, 8th, and the 9th. 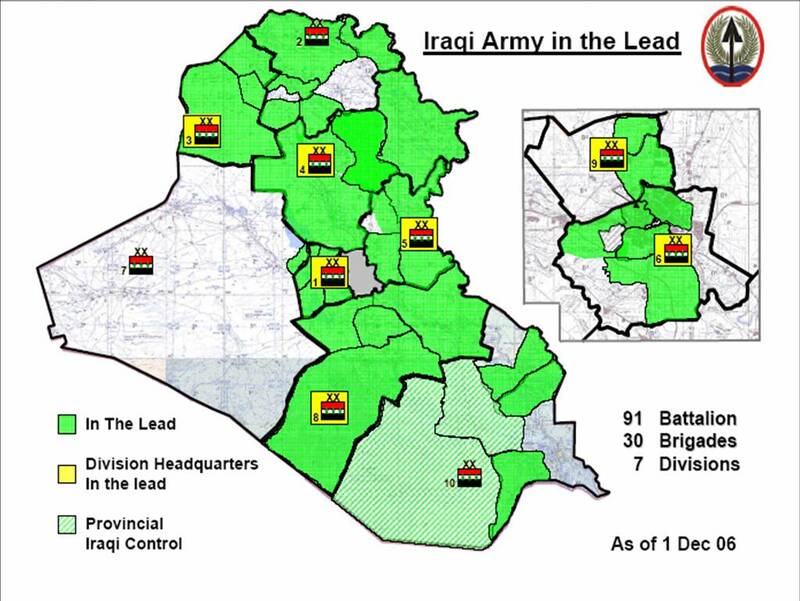 With this transfer, the ISF, as you can see — as you look at this chart, the green area indicates where Iraqi army units are in the lead, the yellow where the division headquarters is in the lead, and then these are where we have provincial Iraqi control. And again, I think we all know down here in the south is where the provincial Iraqi control has occurred, and in the green areas is where we find that the Iraqi forces are in the lead, and then where we have yellow that’s the division headquarters has assumed the lead for the coordinating, the planning and the executing of operations independent of coalition forces — thus far, to date, seven division headquarters, 30 brigades and 91 battalions. The majority of the violence here still occurs in a very tightly area within 30 miles of Baghdad. Iraqi security forces and coalition forces continue to pursue illegal armed groups in this area through the execution of focused, intelligence-driven raids. Iraqi divisions that are in the lead in their own areas of responsibility are capable of coordinating, planning and executing security operations independent of coalition forces. 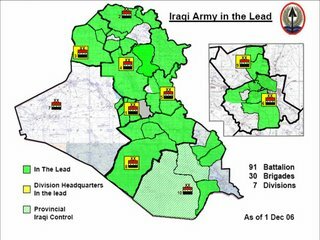 The ability of the 3rd Iraqi Army Division to control its own maneuver space and maintain stability and security in the area will determine the level of assistance that they receive from coalition forces. Thus far, the 3rd Iraqi Army Division headquarters has demonstrated that it’s fully capable of taking over security operations in their area of Nineveh Province, which includes the major cities of Tall Afar and of Mosul. Fayir (ph), he is one of AAM’s — Abdul al-Masri’s — drivers. We know that he has been involved in personal confidant of AAM and helping to facilitate meetings. 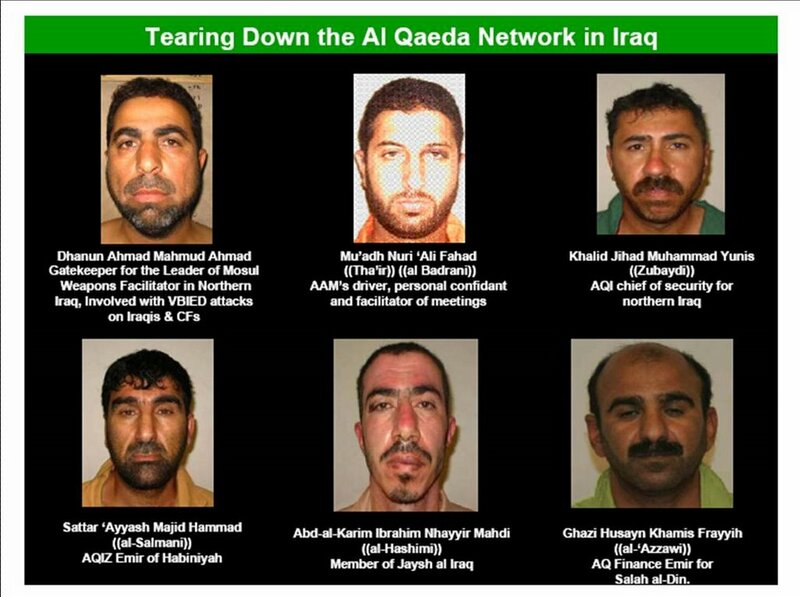 As Dr. al-Dabbagh presented last week in our joint press conference, we have seen some significant gains in dismantling al Qaeda in Iraq’s leadership, and the images of these six that were captured recently have been released by him. Focused operations against al Qaeda in November resulted in 205 assaults on objectives, resulting in 126 terrorists being killed. This is about 28 percent of the anti-Iraqi forces that were killed during the month of November, and there are another 522 suspected detained, along with the rescue of a kidnapped Iraqi policeman. 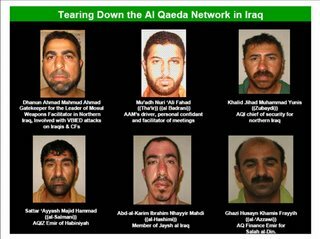 We understand the government of Iraq will release further information this week on the dismantling of al Qaeda in Iraq and on Ansar al-Sunna leadership. Update: Brilliant! The Iraq Study Group wants more combat trainers! Austin Bay earlier said that the Iraq Study Group was cover for the democrats. It looks like he may be right on.